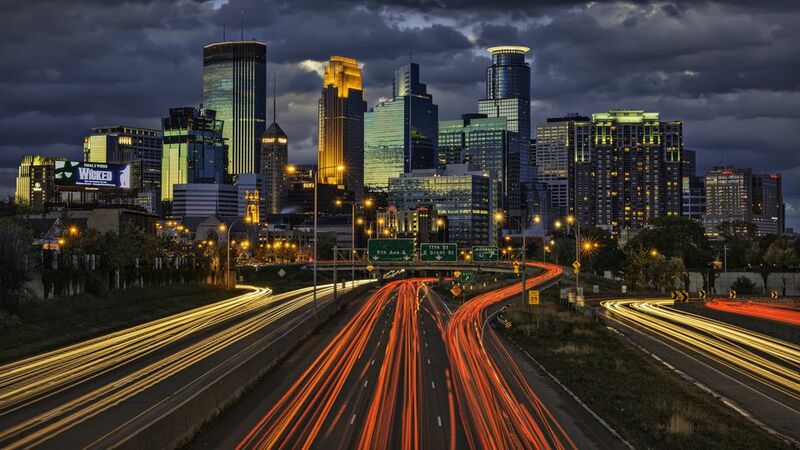 It happens to the best of us: You are driving down the street in Minneapolis in a hurry, and all of a sudden there's a siren and flashing lights behind you. Next thing you know, a police officer is walking up to the window and handing over a moving violation ticket for speeding. A small consolation is that you are not alone: Over 500,000 traffic and parking tickets are issued in Minneapolis in an average year. What is the best way to deal with speeding tickets, and other moving violations? Pay the ticket. You can pay the fine at a Hennepin County District Court location, by mail, online, or by telephone. Paying a ticket is equal to an admission of guilt to the offense. The moving violation will go on your driving record, and your insurance costs will likely increase. Ask to continue the case for dismissal. Which means if you have a good driving record, the speeding ticket is kept off your driving record. You'll need to meet with a Hearing Officer to discuss the ticket. The specific rules regarding a continuance for dismissal vary between cities in Hennepin County, but for violations committed in the City of Minneapolis, it works like this: If your driving record has been clean for two years, and you don't have any other pending violations, the hearing officer can continue the case for dismissal. You'll have to pay a fine, and agree that you were speeding. If you don't get another moving violation in the next year, this ticket will be dismissed and will never go on your driving record. If you do get another violation in the next year, then it will automatically go on your driving record. The rules for other cities in Hennepin County differ slightly, in the amount of fine payable, and the length of clean driving record required before the violation. This option is not available for some cities in Hennepin County. If the violation was in a municipality other than Minneapolis and you think you would be eligible to continue the case for dismissal, call the Hennepin County courthouse for advice. Seeking a continuance for dismissal is best for people who were speeding, but don't have any other recent moving violations. You can see hearing officers on a walk-in basis at Hennepin County Government Center in downtown Minneapolis, or make an appointment with a Hearing Officer at the Hennepin County Government Center or one of the suburban locations. Bring a photo ID and the speeding ticket with you. If the Hearing Officer can't continue the case for dismissal, you can then pay the fine, or have the case set for trial by judge. Discuss the Case with a Hearing Officer. Police officers do make mistakes, and there can be extenuating circumstances. Do you believe the speed recording equipment was faulty? Was there a medical emergency? If you got a ticket that you don't think you deserve then discuss the case with a Hearing Officer. You can see a Hearing Officer at one of the Hennepin County court locations. Bring the speeding ticket, a photo ID, and any supporting documentation for your case. The Hearing Officer will review the citation, your citation history, court history, and driving record. They will listen to your explanation and consider any evidence you can provide to support your case. Hearing Officers have the power to dismiss your case if they accept your explanation, for violations committed in most cities in Hennepin County, including the City of Minneapolis. For the best chance of having your case resolved by the hearing officer, bring supporting evidence with you if you have any. If the Hearing Officer can't resolve your case, they can set the case for a court hearing for trial before a judge. What If I Can't Pay the Fine? Do not ignore a speeding ticket fine. Late payment penalties are added after 21 days, then extra penalties if the fees are 45 days overdue. If the fine is still not paid after 45 days, Hennepin County Court will notify Driver and Vehicle Services (DVS) with a request to suspend your driver's license. The fine will also be turned over to a collection agency, which may lead to your vehicle being impounded. Hennepin County Court may also issue a warrant for your arrest. If you can't afford to pay the fine at all, the Hearing Officer may also be able to allow you to do work service in the Sentence to Service program, where you participate in community service instead of paying the fine. Again, you must see a Hearing Officer before the fine is due.